The last to be reviewed of Disney’s June 11 Blu-ray upgrade titles (The Emperor’s New Groove, Atlantis: The Lost Empire and Lilo And Stitch) is also probably the best all-round entertaining feature; it’s certainly the biggest box-office hit of the three. Interestingly, by design or not, these titles represent three consecutive years of Disney pictures, the first two being released in 2000 and 2001, respectively, with Lilo And Stitch coming to theaters in 2002, also somewhat marking the last gasp of the creative and commercial success of the 1990s Disney renaissance that had burst out around the time of the one-two-three-punch of Beauty And The Beast’s Best Picture Oscar nomination, the commercial success of Aladdin and the record-breaking phenomenon of The Lion King earlier in that decade. The release of Toy Story in 1995 really can’t be underestimated, bringing about a sudden change in audiences’ taste in family film-going that, coupled with then-Disney head Jeffrey Katzenberg’s desire to take Beauty’s nomination and build on it to find a project that could win the award, meant that Disney’s traditionally animated films were either seen as too sombre or not keeping up with the times. Although hits, the likes of Pocahontas, The Hunchback Of Notre Dame, Hercules and Mulan had proved less successful in the second half of the 1990s than Pixar’s A Bug’s Life and Toy Story 2, and Disney also had to contend with DreamWorks, co-founded by Katzenberg after internal politics saw him leave the Mouse House and where he would somewhat fulfilling his intention by winning an Oscar with the first Best Animated Feature prize, for Shrek. At Disney’s, Tarzan, in 1999, was arguably the last hurrah of the kind of vibe that had defined the technological, artistic and commercial breakthroughs of the Studio’s past ten years or so, and led a mini-creative spurt that resulted in another creative risk, the follow-up to Fantasia in 2000, as well as the three features that the home video department have knowingly, or unknowingly, grouped together in their June 11 releases. Each of these films make them unique in the Disney line-up: although comedy has been tackled before, in everything from Dumbo to The Jungle Book and Aladdin, the freewheeling The Emperor’s New Groove was unlike anything we’d seen from the Studio before, going from being an epic movie with perilous production problems to a knockabout comedy that threw wild abandon to the wind. Likewise Atlantis: The Lost Empire, a throwback to the kinds of adventure stories that its filmmakers had grown up watching in the 1950s and 60s, and many of which had been made by Walt Disney himself, broke the visual mold and cut itself loose from including any songs in its mix, marking itself out as another true departure more so than any of the films in the second half of the 1990s could claim to do so. Although a musical approach is often indelibly linked to the Studio’s output, Disney had tried altering the nature of songs in their films since Pixar’s Toy Story used them as overlaid tracks, not musical cues, and arguably created more depth by going the same route for Tarzan and, eventually, dropping a song component completely for its first own computer animated picture, Dinosaur and Atlantis. 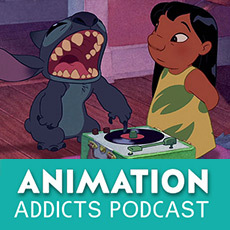 A quasi-combination is at the heart of Lilo And Stitch which, created by artist Chris Sanders (who also voices Stitch) within the Disney animation group, does break away from the usual Disney conventions with some style while also retaining the strong storytelling traditions of the Studio’s past. Sanders would rise to prominence as the result of this film’s success, although he wouldn’t enjoy the autonomy he seems to have done here again; his luscious-looking but (by most accounts) rudderless American Dog was an early casualty of the John Lasseter regime’s takeover of Disney Animation in their merging with Pixar. Although the new edict was for projects to be “director driven”, it seemed you had to be the right director: a title switch to Hollywood Dog was the first of many changes that saw Sanders bolt for the door and new achievements at DreamWorks and the How To Train Your Dragon franchise. In many ways, Sanders was the fresh, new way of thinking that Disney needed and, truth be told, probably still needs. I’m not quite as big a fan of How To Train… as I am of Lilo And Stitch, which I still remember seeing on its opening Friday night and again the following Wednesday. I had been struck by the basic core elements which, when described as Disney, sci-fi and Elvis, would make anyone initially scratch their heads! Add in a Hawaiian setting (beautifully rendered in watercolor backgrounds that add a further departure from the Studio’s usual visual tone), and the link to Elvis Presley, who somewhat became forever linked to the islands through a couple of films and albums he recorded in tribute, and your interest is either further raised or the premise starts to become even more bizarre and random. 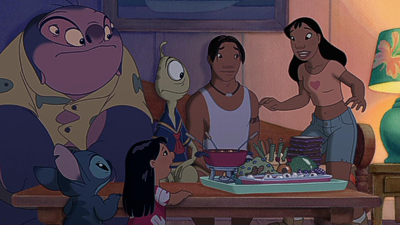 Such is the magic of Lilo And Stitch, which mixes the most erratic of elements into what turns out to be an otherwise straight, and refreshingly eclectic, Disney story! If Tarzan was the last great dramatic turn from the Studio’s hand-drawn animation artists, then Lilo And Stitch would be the final note on the subject. 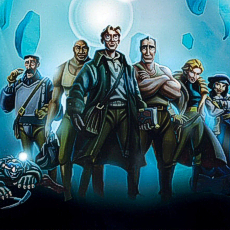 The films that came afterwards (Treasure Planet, Brother Bear, Home On The Range) did have things to recommend them, but they either struggled creatively and artistically to capture the true Disney essence, and certainly failed to capture the audiences’ tastes that had moved on to embrace the new look and feel of CGI comedy movies. 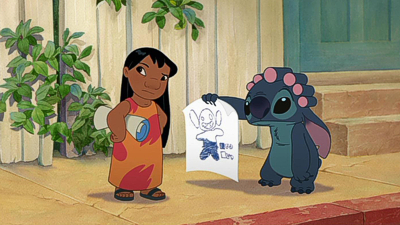 But exactly because Lilo And Stitch didn’t conform to what an animated film – classically drawn or computer rendered – should be is why I think it broke through any perceived barriers to become not only a big hit, but a franchise that would inspire three made for video follow-ons and not one but two television series, the rebooted second of which is still playing in Japan today. It’s a film that deserves all the recognition it can get: from the opening titles, which take ten minutes to appear and breaks the “Walt Disney Pictures” and eventual “Presents” titling to suggest something special – an event – is about to happen, to the unexpectedly highly-charged emotional ending, Lilo And Stitch is by far the most satisfying animated film since Brad Bird’s The Iron Giant and Disney’s own Tarzan. And the reason, so far as I can tell, is because of the exceptional balance between the diverse elements that make up the whole show and ultimately provide us with the kind of Disney movie we truly hadn’t seen before. Sci-fi elements, for instance, were not alien to the Studio’s films, but one wouldn’t associate them with them either. Comedy, while a staple of Walt’s early shorts right through to New Groove, was often gentle and not as knockabout or randomly influenced as in films from other studios. Then there’s the choice of location and its contemporary setting; there’s no “far off land” of “once upon a time” and, even if Hawaii does evoke a more exotic feel more in keeping with the non-everyday magic we expect from Disney, the fact that Lilo And Stitch is set in the here and now breaks away fully from the fairytales and musicals of the Studio’s past. 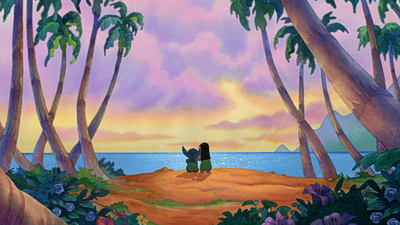 However…Hawaii was chosen precisely to retain a sense of a unique setting, while providing a fresh take for a Disney animated film. Its culture was studied profusely by the filmmakers, who particularly wanted to convey its customs and traditions accurately, further supplying the characters and story with fully-rounded aspects drawn from the real world. 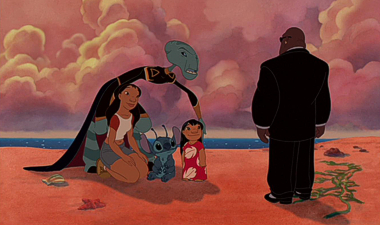 As all good Disney stories should do, Lilo And Stitch also covers some pretty realistic themes for a film of its type: apart from the somewhat stereotypical passed-away parents, it depicts a single guardian raising a dysfunctional child; an Elvis-loving young girl who hits other children. Into this real world arrives a real left-field humdinger: an alien, of all things in a Disney picture, who has escaped from an intergalactic prison and disguises himself as a dog. Somehow, it doesn’t seem as crazy as it sounds, the film cleverly opening with Stitch’s escape and so laying down its sci-fi credentials very early on so as to not feel like a schizophrenic movie. And the aliens themselves aren’t particularly of the Ridley Scott, super-scary kind, being quite cutely drawn monsters and creatures, and alien in their shapes and sizes than because of any ferociousness. These aren’t grotesque CGI creations, or latex masks, or prosthetic make-ups, but again “real” alien beings, with their own movements. 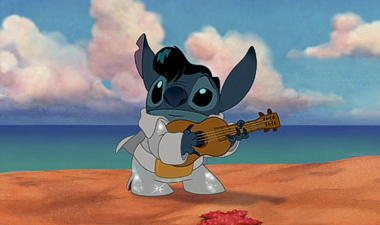 Despite being blue and somewhat razor-ish in style, Stitch himself is a pretty zany character; his chemical make-up offering plenty of chances for him to play the random comedy angle, such as when Lilo discovers he makes for a great amp for her to play her Elvis records through (one of the movie’s few anachronisms that may have kids today wondering what a “record” is). 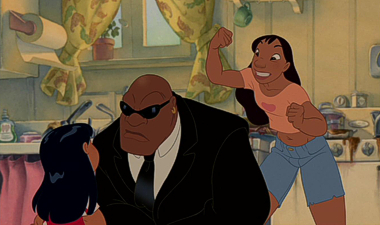 As Lilo further discovers that her “dog” isn’t the pet she thought he was, and the galactic bounty hunters and Stitch’s own creator Jumba move in to recapture him, Stitch finds that he doesn’t have to be the rampaging, bio-engineered fiend he had been designed to be, his new family being the answer to calming him down and helping him be a better alien. 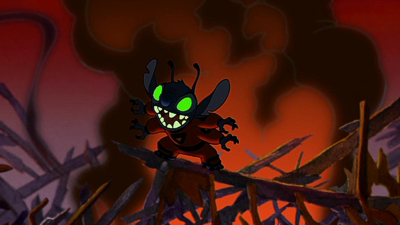 When the government get involved and things come to a head towards the end, Stitch makes a complete about-face, stealing one of the space ships (in a scene reanimated after the horrendous 9/11 attacks, when Stitch was originally going to hijack an airplane) in order to save Lilo, in a sequence that brings the film back full circle to being exactly the kind of movie we expect from the Studio. Some criticized this getting too sentimental, but for me it’s the perfect conclusion, and the ride to that point is packed with so many memorable scenes, and quite frankly some very non-Disney moments, that it still thrills me at how exciting and well balanced it actually is. 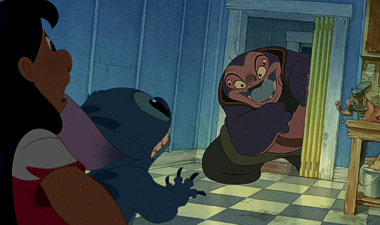 If there is a gripe with how things are resolved, it’s that Stitch doesn’t get left alone on Earth in the long run, most obviously so that mad scientist Jumba and another alien, the occasionally cross-dressing Pleakley, get to stay around “on guard” to watch over Jumba’s experiment 626 if only to appear in the continuing sequel and TV show. 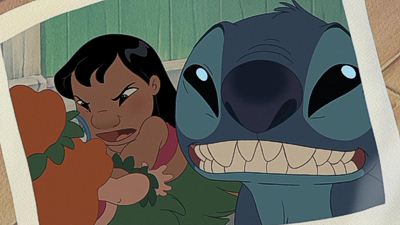 But this is a small point: coming from out of nowhere Lilo And Stitch bowled me over on its original release and remains a totally unique entry in the Disney line-up today, mostly down to its tight script, believable characters, and hilarious situations. 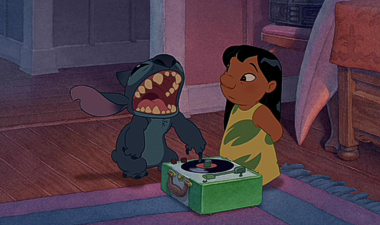 I actually felt, with all her hang-ups and troubles, that Lilo was real person, with real emotions. Her line to Stitch when he’s about to leave (“I know you don’t want to stay. That’s why you wreck things, and push me”) is just heartfelt both in the character’s meaning and in Daveigh Chase’s performance, very naturally coming from a child who really understands her character. Apart from the voices, the animation – from Disney’s sadly shuttered Florida unit and several “guest artists” including Andreas Deja – is striking in its full believability and roundness, not just down to the heavy soft-shading but to the animators’ incredible draughtsmanship that (apart from some of Nani’s movement, and even then only occasionally) really brings these personalities to life and creates truly authentic characters. I think this is where Lilo And Stitch strikes best, as essentially a real-world take on an incredible situation in which the film’s very embrace of the weird, wonderful and randomly bizarre is ultimately, and paradoxically, exactly what makes it all seem absolutely acceptable and work so well. Despite all the disparate elements that could normally indicate a disaster waiting to happen, Sanders and his co-director Dean DeBlois instead have created a charming animated film that, at now over ten years old, should surely begin to be recognized as one of Disney’s last few classics. You wait years for a deluxe two-disc collector’s edition of a title and then what does Disney do? Takes two steps backwards and replaces it with an edition that doesn’t have a fraction of those extras retained! There was also a time when a “3 Disc Special Edition” banner across the top of a package would incite great anticipation, the suggestion of the main feature backed up with not one but two discs crammed full of supplements was at one time a rare occurrence and often reserved for all but the most significant of releases. Lilo And Stitch came right at the end of Disney’s two-disc collector’s DVD sets, released from the late 1990s and full of the kinds of terrific supplements that had pleased so many fans in the LaserDisc era that flourished earlier that decade. 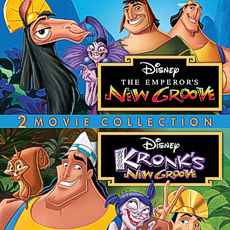 Although Disney’s first few Limited Issue DVDs (including Mulan) were bare bones releases designed to test the waters, DVD was quick to pick up where LD had dropped off, and the next few features all got the same treatment: A Bug’s Life, Tarzan, an Ultimate Toy Story Box and Fantasia Anthology, marking the releases of the second entries in those series respectively, The Emperor’s New Groove, Dinosaur and Atlantis: The Lost Empire all being represented extremely well on home video by comprehensive two-disc DVDs that contained commentaries, documentaries, concept galleries, and any and all amounts of promotional material, including theatrical trailers and music videos, that could be included to document any given film’s production process. Pixar has largely continued this tradition with its subsequent DVD and Blu-ray editions but, after the commercial disappointment of both Dinosaur and Atlantis, and the not-so-stellar sales of their two-disc DVD sets, Disney has never really regained the impetus to produce these kinds of editions since. Materials for Lilo And Stitch had been assembled but a decision was made, somewhere, to cut them back and restrict the title to a single disc release, a practice that has remained in place to this day, right up to the “Collector’s Edition” of Wreck-It Ralph. Since Lilo And Stitch, the Disney standard is for a disc to basically include the movie, a behind-the-scenes featurette, a handful of deleted scenes and maybe one or two promotional items, a routine that continued through Chicken Little and the rest of the 2000s features. Rumor of two-disc editions for the few of the films that had never received that kind of treatment (Hunchback, Hercules and Lilo And Stitch among them) surfaced as Disney began to recycle through their older titles in updated DVD sets with gimmicky monikers. Most of these were cancelled: a reissue for Tarzan, reduced to a single disc release, was the closest things came, the Studio deciding to focus on the two-disc Platinum Edition sets of the ten highest grossing films in the animated division’s library. 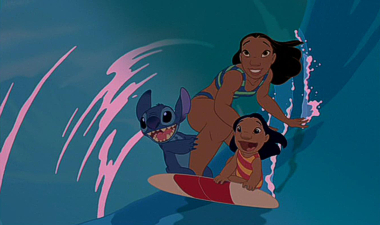 And then, quite suddenly, a Lilo And Stitch: Big Wave Edition was announced…and actually got released. Promising the kind of in-depth set that would rival what Pixar routinely put out – the kinds of sets, ironically, that Disney had pioneered – the Big Wave Edition provided just the kinds of bonus features we loved. What a blow, then, that this new BD update to Lilo And Stitch follows the apparently new Disney edict of their 2-Movie Collections and follows The Emperor’s New Groove to feature the film’s direct-to-video sequel as its only true bonus feature. On one hand, I’m pleased that these films have finally been adopted in these sets’ packaging as the extras offerings they should be…but this shouldn’t be at the expense of losing what is a readily available amount of supplements. Other titles (Mulan and even Atlantis!) have managed to retain a good portion, even if not all, of their supplements alongside their derivative DTV follow-ups, but it seems Disney has now lost all sense of pretence in these quickly released, somewhat factory processed BD updates being anything but essentially bare bones HD upgrades for their main features…and little else. In truth, the video sequel, Lilo And Stitch 2, subtitled Stitch Has A Glitch in its initial 2005 packaging and presented in its native 16:9 aspect ratio, is perhaps the best and most authentic of these such films in terms of coming close to replicating the theatrical experience. 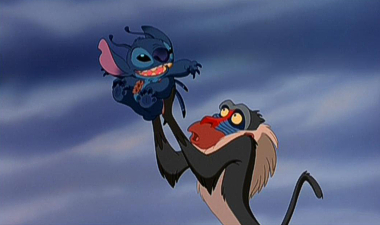 Created by the Australian DisneyToon Studio that eventually grew out of its Walt Disney Television Animation origins to become, for a time, the last outpost of classically animated hand-drawn productions to bear the Disney name, Stitch Has A Glitch may only just about run to 68 minutes, but it’s a top-quality, essentially theatrical level 68 minutes (or, rather, just over an hour with a long end credit scroll) that could have played as an official theatrical sequel given a little more depth to a story that, while it may not bring much new to the series, commendably doesn’t shy away from the themes of the original either. Along with some of the other DisneyToon films from around this same time (The Lion King 1½, Bambi II, Tarzan II, Kronk’s New Groove) one gets the feeling that this is an intended case of quality over quantity: these films could be longer but they seem to have decided to spend their budgets retaining the Disney animation touch instead of stretching things out. This also has a double-edged sword result: one on side this also pleasingly means the plotting can be tighter, telling their stories with more emphasis on getting to the point; on the other, sequences that may have worked better as bigger action scenes or more expressive songs get the short thrift, and the shorted running time doesn’t quite allow for the audience to engage as much with the characters so that, by the films’ ending, the emotion hasn’t quite peaked as much as it could. 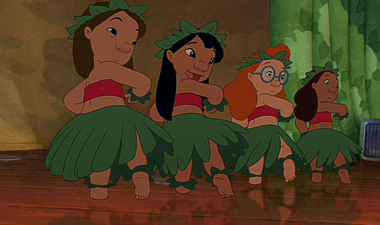 I found this with Lilo And Stitch 2. Regardless of the nuttiness of the original’s conceit at having an alien dog-like creature being taken in by a little girl and evolving through her care, when the ending comes and the dramatic stakes are high, the emotion plays in full force but here it has a lot less impact, the film actually somewhat whimpering out towards its end. 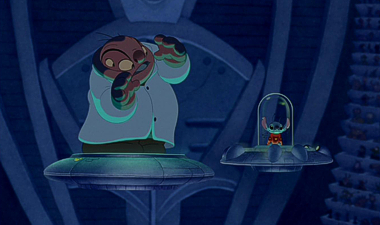 To be honest, it never really quite ever gets going: despite a returning voice cast (now with Dakota Fanning as Lilo) and words of praise for the film from Sanders himself, the overall tale of Jumba having to find a way to regenerate Stitch when it turns out he may be dying – the “glitch” in the title – on Earth, Lilo And Stitch 2’s storyline is otherwise pretty thin (albeit disguised with some lovely visuals and a score from Joel McNeely that nicely recalls Silvestri’s original), right down to Stitch’s final character plot point being resolved all-too easily in literally the final 60 seconds of the film without much consequence either way. 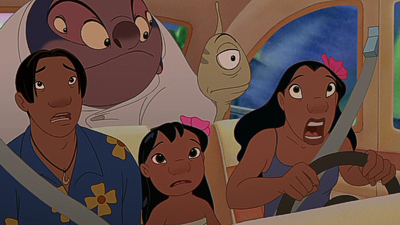 Luckily for those of these characters, a bit more action was still to come, chronologically speaking, for while Lilo And Stitch 2 follows the original film in story and release date, it also comes before the alternative Lilo And Stitch: The Series, Disney’s franchise-extending program that somewhat attempted to turn Sanders’ concept into a Pokemon-styled property. Another DTV, Stitch! 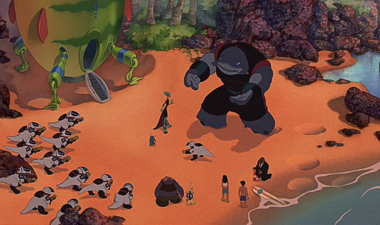 The Movie ostensibly opens the series by acting as a pilot film, with the series itself following Lilo and Stitch’s attempts to recapture all 625 of Jumba’s other experimental creatures (Lilo And Stitch 2, unrelated to the series, was released to video midway through its run), while a further DTV, Lilo Leroy And Stitch completed the series’ run. More recently, Stitch has returned to small screens in Japan, where an exclusive new animation program caters exactly to those Pokemon-tailored needs. With such an obviously popular property for the Studio, one would think they’d treat it better than they have on this BD release. As with the concurrent Atlantis release, why not retain the Big Wave Edition’s two-hour documentary for a start? Or how about provide some real value for fans and include both Stitch! The Movie and Lilo Leroy And Stitch as extras, even if in standard definition only (probably because Disney can see the dollar signs in releasing those as their own 2-Movie Collection down the line, probably). Releases like these – especially for the bigger hits of the Studio’s more recent history – are not only slaps in the faces of the artists who created them, but the fans who made them hits. With the BD containing nothing of worth over the two included movies, it’s down to the included DVDs, one for each film, to provide even the slimmest of bonus material. Fortunately, the Studio has elected to include a replica (complete with dated previews) of the first disc from the two-disc Big Wave Edition and so giving us the chance to revisit Chris Sanders, Dean DeBlois and producer Clark Spencer’s excellent Audio Commentary track from that release! 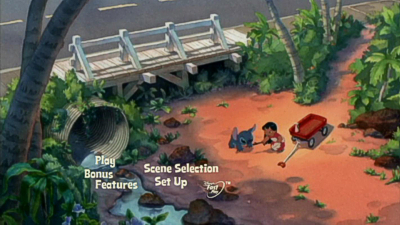 The original featurette from the single disc DVD isn’t here (since it was replaced with the more extensive doc on disc two of that set), but we do have a Your Ohana Music Video, three Islands Of Adventures and a Create Your Own Alien Experiment set-top games, plus a DisneyPedia: Hawaii – Islands Of Aloha featurette on the film’s real-life setting. These extras continue: A Stitch In Time inserts Stitch into still frames from the Studio’s past films, a Hula Lesson and brief featurette on Animating The Hula in the film, behind the scenes on Wynonna’s Burning Love track, I Can’t Help Falling In Love With You Music Video with A-Teens and, best of all, four of the brilliant Inter-Stitch-ials, the theatrical teasers that had Stitch gate-crashing fully animated classic moments in other then-recent Disney pictures, Beauty And The Beast, Aladdin, The Little Mermaid and The Lion King among them. 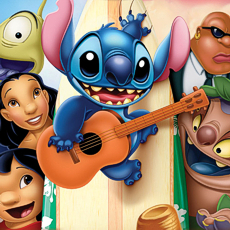 The second film’s DVD doesn’t contain much more, just an energetic Jump 5 Music Video for the first film’s Hawaiian Rollercoaster Ride, a couple of set-top games and, most notably, the four 4½-minute The Origin Of Stitch Bonus Short, fully animated as a kind of precursor to the TV show. We’ve seen that “3 Disc Special Edition” banner across the top of Disney’s Blu-ray updates before and, although it often means the BD itself contains less than a previous DVD’s release of the same title in terms of extras, we at least used to have the listings table on the back of the sleeve to see what those supplements were. But here, as with the Studio’s other June 11 release of The Emperor’s New Groove (and Oz, The Great And Powerful), there’s a new design approach to Disney’s home video packaging: Oz retains its extras information, but here any description of what you might find on the discs you’re buying is missing, right down to losing the aspect ratio specs for the films themselves. 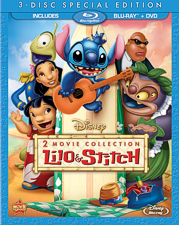 Elsewhere it must be said that this could be the best cover art Lilo And Stitch has ever got on home video, the initial cast-on-a-surfboard image being something of an odd choice for the overall movie, and the mashing of images for the Big Wave Edition being just that: a mish-mash. None of the sleeves can ever match the evocative and gentle final theatrical artwork – and we wouldn’t expect the poster in which Disney characters recoil at Stitch’s joining their family (a reaction, perhaps, based on the Studio brass’ reaction to the movie!?) – but at least this addresses the original film mostly, and relegates the sequel (which retains its title subtitle here) to bonus status on the embossed slipcover’s reverse. 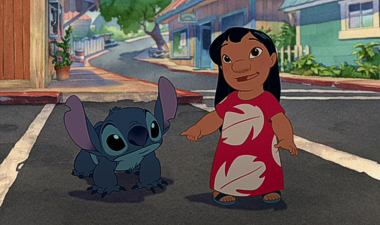 On the plus-side of the BD not containing too much content is the fact that both movies look exceptional in new HD transfers, the original Lilo And Stitch never having looked as good and easily the best looking of Disney’s three June 11 titles. The watercolor backgrounds especially get a chance to shine: even on DVD their uniqueness was dimmed slightly by the lower resolution that, on smaller screens, didn’t really show off the artwork and production design’s alternate approach, but here almost any frame, and in particular the character-free shots, could be paused and left hanging on a flatscreen wall as a piece of animation art. It’s a truly stunning transfer that’s free of even the slightest blemishes, although those used to putting Disney’s titles through extra scrutiny may notice some banding (something I am increasingly prone to put down to the computer coloring even if I don’t remember seeing such instances in theaters) and perhaps a little ringing around the super-sharp character lines (again, I do sometimes feel HD can be even too clear for modern line animation) , while the sequel’s level of quality animation and focus in retaining the first film’s visual approach means it looks better than most, and the transfer shows it off to its best. Mixing Elvis with the kinds of sci-fi sound effects usually reserved for something like a Star Trek or Star Wars movie, Lilo And Stitch’s audio is as eclectic as the film it accompanies! It’s a sprightly movie to begin with, and the sound designers have great fun with all the space movie staples, while Presley has never sounded so clear and Silvestri’s score sweeps through the action as well as pulling back for the smaller moments. To its credit, and almost matching the original’s energy but for less in the way of standout moments, the video sequel’s track is far beyond what one might have expected, adding up to a top score all around. It’s hard to recommend any of Disney’s June 11 Blu-rays based on the amount of extras all three titles drop (even with its two-hour documentary, Atlantis is far from the all-encompassing production document that its Collector’s Edition DVD was). 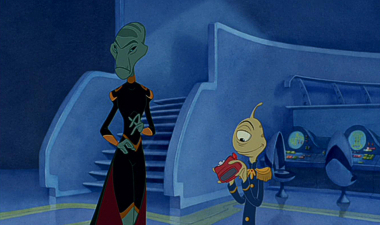 While it’s good news that the included DVD is the first disc of the collector’s set – and to be fair, any extras would have been presented in standard definition anyway – but it’s ridiculous that we should have to watch such a visually stimulating film as Lilo And Stitch without the benefits of its new HD transfer in order to hear its commentary track. The total lack of extras on the BD makes for a poor situation: the inclusion of the sequel’s own extra, The Origin Of Stitch short, and the Inter-Stitch-ials should have at the very least been given an HD upgrade. The inclusion of the DVD’s supplements are welcome, but this set can only really be recommended for the HD upgrade of the main feature’s image quality and little more. Lilo & Stitch: Producer Clark Spencer on a Hawaiian Roller Coaster Ride!